Speechie Freebies: Time to Warm Up! Phil may have predicted an early spring, but it's been unusually cold here! 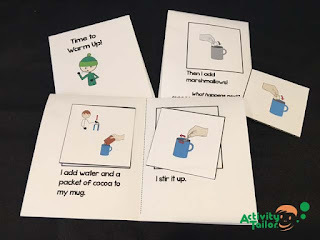 I'll be bringing in some hot chocolate envelopes and marshmallows this week for experiential learning and following the lesson up with a sequencing mini-book. Because I've created these to include three different levels, they work for a large variety of kiddos!